We believe that the hurricane center will skip the tropical depression stage and go straight to naming tropical storm Nicole. Deep convection has expanded rapidly with very heavy rainfall south of the Cayman Islands west to near Belize. Pressures are dropping and seas have already built to at least 9 feet. Winds have gusted to over tropical storm force on a buoy south of the Cayman Islands. A hurricane hunter recon will investigate near midday. We'll have a better handle on the position fix and strength after the hurricane hunter arrives. Right now there appears to be two low pressure areas and we're not sure yet which is the dominate one. 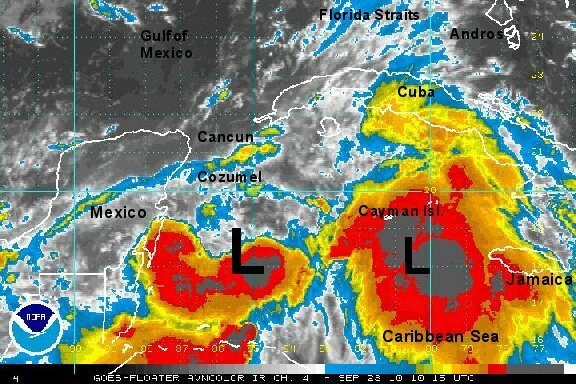 As of 7 am edt / ast two low pressure areas were south and west southwest of the Cayman Islands. Top sustained winds are estimated at 35 mph. Movement- stationary should be north northeast soon. Pressure estimated at 1000 mb. Forecasts develop this tropical cyclone and take it over western Cuba by tonight, and across the Florida straits into south Florida by midday Wednesday. Interaction with land will hinder development as it moves north northeast. The hurricane center did not go straight to tropical storm Nicole. They said that it was close to tropical storm strength and classifed it as tropical depression 16. The hurricane hunter should be able to give us additional information soon. It can't be understated the importance of the visible satellite imagery. 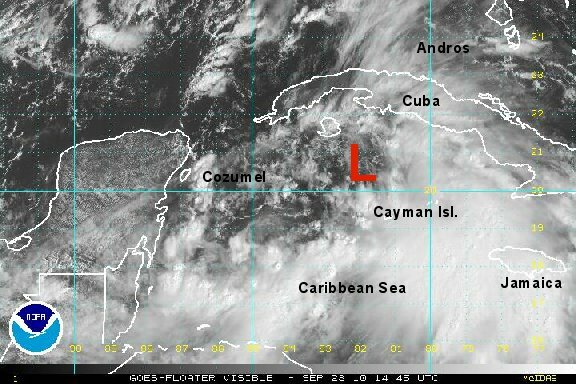 It clearly shows the low south of Cuba. Neither of our low center estimates were in that location. As of 11 am edt tropical depression 16 was centered near 20.6N / 82.5W or about 180 miles south of Havana, cuba. Top sustained winds are estimated at 35 mph (35 mph NHC 11am advisory). Movement- north northeast at 10 mph. Pressure estimated at 1001 mb. Forecasts develop this tropical cyclone and take it over western Cuba tonight, and across the Florida straits into south Florida by midday Wednesday. This track will take the low center near Miami and West Palm Beach, Florida. Interaction with land will hinder development as it moves north northeast. The low will combine with a front on the Southeast coast bringing heavy rain to parts of the Florida east coast and into Georgia, South Carolina and North Carolina. The rain may affect the Mid-Atlantic after that. It looks like tropical depression 16 has stalled or is still just organizing. In actuality, it looks like the center is farther south than at the 5 pm estimate. 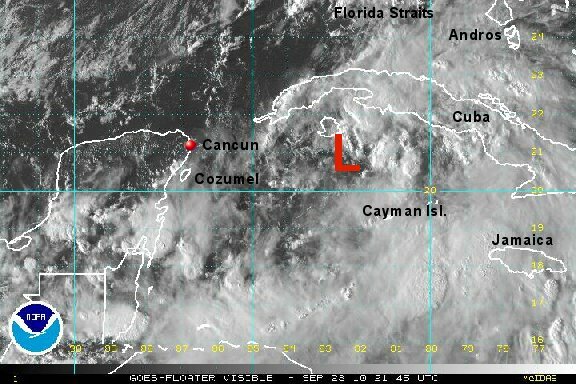 The low center is broad with little convection near it. That is not unusual for a tropical depression or weak tropical storm. It looks like it will still become tropical storm Nicole then transform into a subtropical cyclone as it merges with a front off of the Southeast coast. It will then become an extratropical system as it moves into the Mid-Atlantic and Northeast U.S.
As of 7 pm edt tropical depression 16 was centered near 21.5N / 82.4W or about 115 miles south of Havana, Cuba. Top sustained winds are estimated at 35 mph (35 mph NHC 5 pm advisory). Movement- north northeast at 5 mph. Pressure estimated at 1001 mb. Forecasts develop this tropical cyclone and take it over western Cuba tonight, and across the Florida straits into south Florida by late Wednesday afternoon. This track will take the low center near Miami and West Palm Beach, Florida. Interaction with land will hinder development as it moves north northeast. The low will combine with a front on the Southeast coast bringing heavy rain to parts of the Florida east coast and into southeastern Georgia, South Carolina and North Carolina. The rain will then move up through the Mid-Atlantic and Northeast. A recon has found winds at about 45 miles per hour so it looks like Nicole may be finally named this morning. With or without a name, heavy rain is spreading from the middle Florida Keys northeast past Miami, West Palm Beach to south of Melbourne. Five inches or more of rain may fall over southeast Florida. Rain will continue to increase in North Carolina today with rainfall amounts locally to 3-5". Totals of 1-4" can be expected into the Northeastern U.S.
Rainfall amounts over 10 inches in the Cayman Islands and Jamaica may be seen. It's possible that this rain in the northwest Caribbean is breaking off from the circulation of of TD 16 as a new, second low pressure area tries to form. As of 7 am edt tropical depression 16 was centered near 23.4N / 81.4W or about 90 miles south of Marathon, Florida / 180 miles south southwest of Miami, Florida. Top sustained winds are estimated at 35 mph (35 mph NHC 5 am advisory). Movement- north northeast at 14 mph. Pressure estimated at 997 mb. The track will take the low center near Miami and West Palm Beach, Florida today. Interaction with land and wind shear aloft will hinder development as it moves north northeast. The low will combine with a front on the Southeast coast bringing heavy rain to parts of the Florida east coast, North Carolina, and into the Mid-Atlantic and Northeast. Models are still developing a second low in a few days crossing Cuba into the Bahamas. At this time it is predicted to be a weaker low. It's worth keeping an eye on. 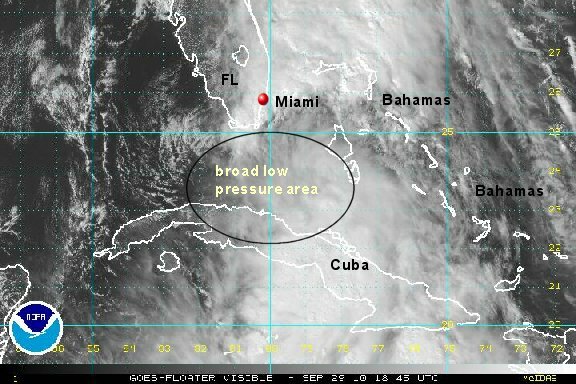 After seeing visible satellite imagery the past several hours it was becoming apparent that the low was not in the Florida Straits. That was a vorticy swirling around a broader low which has been relocated farther southeast still over Cuba. With the relocation tropical storm warnings and watches have been dropped for Florida. Still, heavy rain will be a concern with some flooding likely. Nicole will lose tropical characteristics as it moves through the Florida straits west of the Bahamas. It will merge with a front taking its heavy rain into the Southeastern U.S.
Five inches or more of rain may fall over southeastern Florida and the northwestern Bahamas. Rain will continue to increase in North Carolina today with rainfall amounts locally to 3-5". Totals of 1-4" can be expected into the Northeastern U.S. Rainfall amounts over 5-10 inches in the Cayman Islands, Cuba, and Jamaica may be seen. As of 11 am edt Nicole was centered near 22.6N / 80.6 W or about 260 southwest of Nassau, Bahamas. Top sustained winds are estimated at 40 mph (40 mph NHC 11 am advisory). Movement- northeast at 9 mph. Pressure estimated at 996 mb. The track will take the low center just east of Miami and West Palm Beach, Florida today. Interaction with land and wind shear aloft will hinder development as it moves north northeast. The low will combine with a front on the Southeast coast bringing heavy rain to parts of the Florida east coast, North Carolina, and into the Mid-Atlantic and Northeast. Nicole does not appear to exist any longer. It always has had a weak surface circulation. There still does appear to be a low level swirl just south of the Florida Keys. It is interesting that Nicole - barely a tropical storm - has caused a big rainfall event. A stationary front stretches along the Mid-Atlantic coast. This front has been a tropical moisture conveyer belt. Eastern North Carolina has seen a large area of 6-10" of rainfall with another 5"+ tonight into Thursday. Doppler estimates of 4-6" are seen from the middle Florida Keys to Melbourne. Jamaica and central Cuba have likely seen 5-10" of rainfall. Kingston, Jamaica had reported nearly 8" for a 24 hous total this morning. 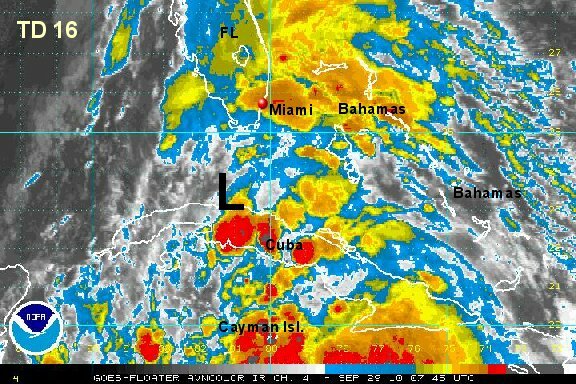 The northwest Bahamas and Cayman Islands have also had heavy showers. Heavy rain will continue in those areas with another area of disturbed weather developing. 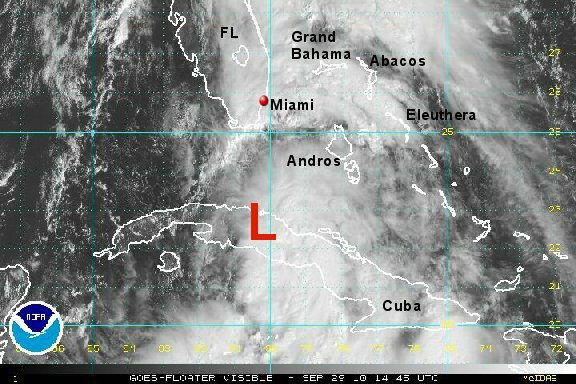 As of 4 pm edt Nicole was centered between the coast of northwest Cuba and the Florida Keys. Top sustained winds are estimated at 40 mph (40 mph NHC 2 pm advisory). Movement- northeast at 10 mph. Pressure estimated at 996 mb. Models are still developing at least one more low pressure system in a few days crossing Cuba into the Bahamas. It's worth keeping an eye on. The hurricane center just delared Nicole dissipated. No surprize here. Florida Keys to Melbourne: 4-6", Eastern North Carolina: Wilmington -Rocky Mount - Goldsboro - Greenville 12-15", Tidewater of Virginia, central Maryland, eastern Pennsylvania, western New Jersey, eastern and central New York state: 4-6".